Not sure if this has been posted the right place. Thanks so much for finding and posting this! This is a terrible example of the greed and the scam of taking money and then dumping patients who 'don't meet their qualifications'. Here's one of the NN Vista Bay videos showing they use the name "Steven Stein"
but for years, at least until mid 2010, he was, and could still be, the medical director for Camp Recovery in Scotts VAlley in Santa Cruz County. This case is another reason why Narconon should be shut down. Narconon is anti-mental health care and this is the product. What a damn shame. It reminds me of the death of MARY HEATHER SPENCER. Her boyfriend George Bell III left Narconon Oklahoma after 3 months, having been sent there because while on PCP he beat up his girlfriend. So after the 3 months, he returns ( supposed to be 6 months) and he kills the girlfriend in a drug rage 3 days after leaving NN. His mother who paid for him to go to Narconon refused to testify, despite the strong evidence that she was in the home when thisn happened and did not alert police right away. The mother of convicted killer George Bell III could give a statement under oath soon for the first time about what she witnessed the night her son beat Heather Spencer to death. The statement would become part of a wrongful death suit filed in 2008 against the Bells as well as the drug treatment program George Bell III attended before the murder. The suit seeks the maximum amount of compensation and punitive damages allowed under Mississippi law. George Bell III killed Spencer, his 28-year-old ex-girlfriend, in his mother's home between Sept. 10 and 11, 2007, just days after leaving the Narconon Arrowhead drug rehabilitation center in Canadian, Okla. He then kidnapped Spencer's roommate at gunpoint and took her to a house on Trawick Drive in northeast Jackson. George Bell pleaded guilty in February 2008 and is serving a life sentence. The family also blames Narconon and its parent corporation, Narconon International, of failing to adequately treat George Bell III and to warn Spencer that Bell left the program months shy of completing it. Narconon International was founded in 1966 by William Benitez, a former Arizona state inmate, and has grown into a network of 120 centers worldwide. "Our drug rehabilitation program does not use drugs or medications to solve the problems caused by drugs, but does use nutrition and nutritional supplements as an important component of its delivery. Thus the Narconon program is neither a psychiatric nor medical, but a social education model of rehabilitation," the program's Web site states. Francomb said she questions Narconon's methods because they follow the principles of the Church of Scientology, a religion founded in the 1950s based on the teachings of science fiction author L. Ron Hubbard. Should have Narconon Arrowhead freaking out. Good. It can be deadly for someone with Congenital Adrenal Hyperplasia to be taken off their medication, especially if their antibiotics for pneumonia are also taken away. 2: Hospitalization is required for adequate treatment and monitoring. 3: Low blood pressure may be treated with intravenous fluids. 4: If infection is the cause of the crisis, antibiotic therapy is indicated. Death may occur due to overwhelming shock if early treatment is not provided. Go to the ER or A & E or call the local emergency services if symptoms of acute adrenal crisis develop. [..]Read the father's facebook wall: you need to be signed in I believe. There is much telling information on it. Scroll down to April 1st and then on up. He also comments in reply to replies, so look at those. After reading what he wrote, it is my belief that Narconon withheld this girl's medication, a corticosteroid called Dexamethasone used for a chronic condition which the father mentions about in an earlier comment about her being ill with it and having pneumonia before her death. If you read his comment announcing the death, he says she died of pneumonia and adrenal failure - although her lab work was ok before she left. The parents may not be aware that Narconon takes medicines away as soon as the student is registered ( the 'student' signs a statement agreeing to no use of 'drugs'including asperine or tylonol. Most people do not know that this includes prescribed medicines. Sometimes it can take up to 3 days for the Narconon Case Supervisor to approve the use of prescribed medicines before they are given to the 'student'. A person who must be on corticosteroids like Dexamethasone can go into adrenal failure if taken off their medicine abruptly. These meds are tapered in increments until down to a low amount because of this and other serious side effects. A former NN student stated that she is friends with the person who worked with the 'girl' in the withdrawal room before she died and found her. This friend was Hillary's 'twin' . I was there from November to February, and I never heard of anything about them having their residential licensing suspended... If they did they just pretended like it didn't happen and kept right on going. I still have several friends that work at Narconon Arrowhead... The body of the young woman who died Tuesday was found when staff was checking vitals in withdrawal. She complained of a pain in her abdomen while running a light objective... The staff member was trained that the pain was triggered by the objective and it would go away after running through it non-stop until the staff member observed the student showing VGIs. During the excessive running of the objective however, she left the sessions and got in bed. It wasn't until they were checking student's vitals in the early morning that they realized she had passed away. Lord God,source and destiny of our lives,in your loving providence you gave us Hillary,to grow in wisdom,age,and grace.Now you have called her to yourself.As we grieve the loss of one so young,we seek to understand your purpose.Draw her to yourself and give her full stature in Christ.May she stand with all the angles and saints,who know your love and praise your saving will. We ask this through Christ our Lord.Amen. My daughter Hillary Holten,may she rest in peace with youdear Father. For all my friends that did not hear about Hillary's passing,I want to let them know.She had a battle with pneumonia and an adrenal failure.We thought she was getting better and the lab tests said that but I guess God wanted her back home.This is the hardest thing that I have had to face and a part of me is missing and I will not be able to get it back ever again.I do not question God's decisions,...I just wish she still was with us.Thanks to everyone for their thoughts and prayers.We are going to have a memorial here in Carrollton Tx the first part o May and will let everyone know when.Again,this is something that is going to stay with us from now on.I just can't get use to not seeing her here with me at home and being able to hug her and tell her I love her and talk to her.This is just too hard for me right now,sorry. Donna,Hillary was my daughter and she passed away from being sick with pneumonia.This all started about 12 days ago,when she went into the hospital.April 15 at 10:22pm. Father and protector of all you have created,we raise our hearts to you today for those who have passed from this mortal life.In your loving mercy,Father,be pleased to receive them in your heavenly company and forgive the failings and faults they must have done from human frailty.For all the faithful who have died we pray, but in particular for those dear to us.We ask this in Christ name.Hillary may be gone,but her spirit walks with me forever.My sweet angel always,no goodbyes,only love. I'm asking all my friends to pray for my daughter Hillary Holten. She became deathly ill ,day before yesterday.She has a condition to were. She take Dexamethasone on a daily basis.Thursday she came home from spending the night with a friend.I noticed that she wasn't feeling to good.She became worse and began throwing up and could not hold down water.This went on all night and into the next day.I finally decided to take her to the ER.She has an infection,Phneumonia,please pray for her,please. This obituary confirms that the girl needed medications. Whether the lack of them played a part in her death, we don't know. Whether the stress in withdrawal while being made to continue on with objective processes despite complaints of abdominal pain is related to her death, we shall see. I just pray for this family and hope you will too. Can the ME run any kind of blood test to determine if the level of corticosteroid in her blood was consistent with taking it up to the time of death, or if the amount in her blood would indicate she had not been taking it prior to her death?? Yes, they can do all that and check the antibiotics she was supposed to be taking while there - they have probably already done that. Some tests take longer than others but they are probably testing everything, including vitamin levels, as they were pumping her up with the drug bomb, too, per the program . 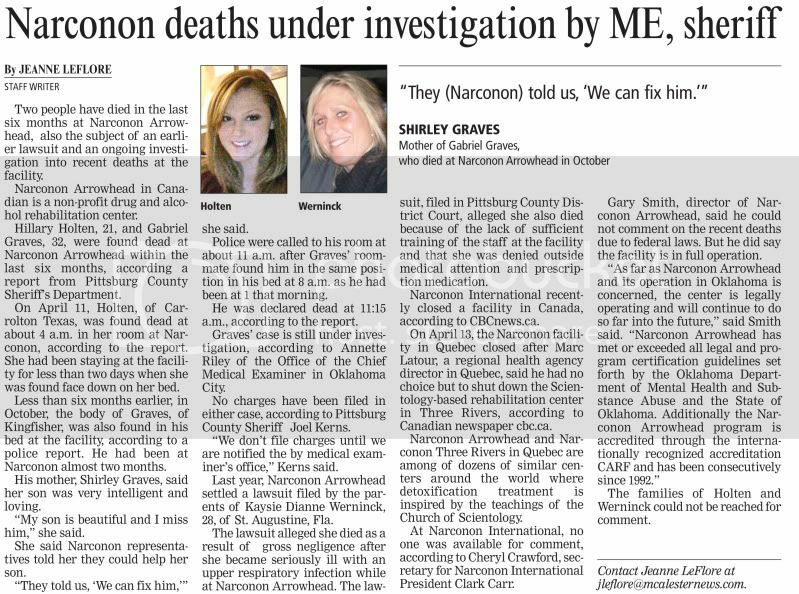 Just posted over on WWP, there's been another death at NarCONon Arrowhead. Stacy Dawn Murphy 20, of Owasso was found dead at Narconon Arrowhead, according to a report by the PIttsburg County Sheriff's Department. This is the third death in the last year. What a shame! I'm so disgusted with the lack of action by state agencies. Documentation that another death apparently did in the past occur here in Georgia @ a Narconon facility. More information will be forthcoming. Until today I was only aware of the tragic death of Patrick W Desmond while in the care of Narconon of Georgia. Moderator's note: I have split the discussion concerning Narconon Arrowhead in Canadian, Oklahoma into another thread: Narconon Oklahoma Multiple Deaths (Was Re: Narconon Deaths). Let's keep this one as a list of Narconon Deaths, please, and have Narconon Oklahoma discussion in the thread linked above.